In need of a vegetable platter that screams freshness and Spring? 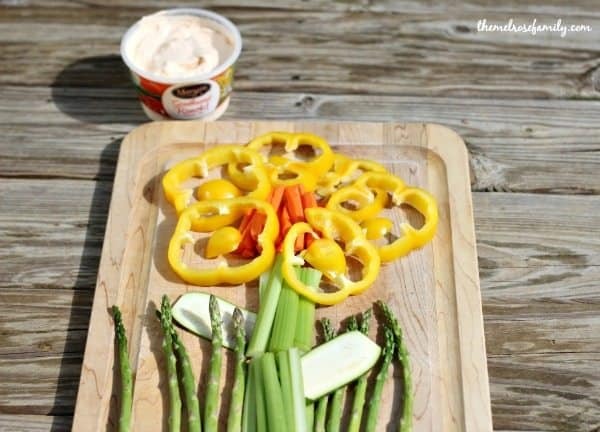 This Spring Flower Vegetable Platter is simple to throw together and so good! 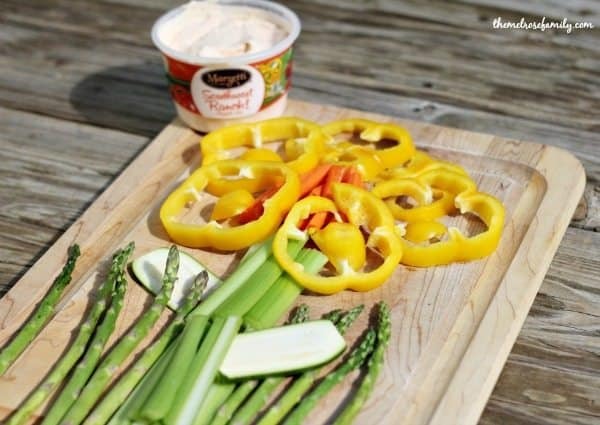 Plus, it let’s the wholesome goodness of your vegetables be the star while the Marzetti® Southwest Ranch Dip adds some creamy flavor. One of my favorite snacks to put out for barbecue and playdates are fresh vegetables. I’m big on presenting them in a different though. I always find that my girls dig right into a vegetable platter if it’s a fun design. They loved my Christmas Tree Platter, but Spring means flowers so I created a giant sunflower vegetable platter for the perfect Spring platter. The stem of the flower are made from celery sticks stacked on top of each other. I then placed carrot sticks as the center of the sunflower with yellow sweet peppers as my petals. The leaves are made from zucchini and the grass are asparagus spears. 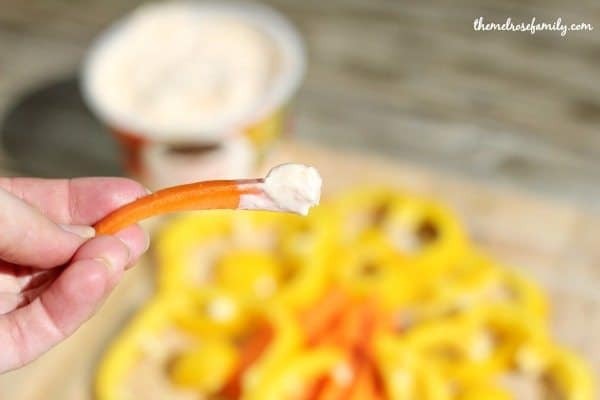 I wanted my dip to add a little creamy zing to the vegetables, which is why I went with Marzetti® Southwest Ranch Dip. I love all the flavors that Marzetti® offers, but my particular favorite is the Southwest Ranch dip because it combines the thick and creamy ranch dip with the savory spices of the Southwest. So good and not overpowering at all. Even my girls love it and you all know how much they dislike spicy foods. It’s the perfect Summer vegetable dip. You can find more great recipes for Summer in the Marzetti® Kitchen as well as on their Facebook, YouTube and Pinterest accounts. Clean and slice the celery stalks in half lengthwise and then cut them into 2-3 inch sticks. Place the celery sticks in two piles to create the stem of the flower. Clean and slice 5 carrots into celery sticks and place in the center to create the center of the flower. 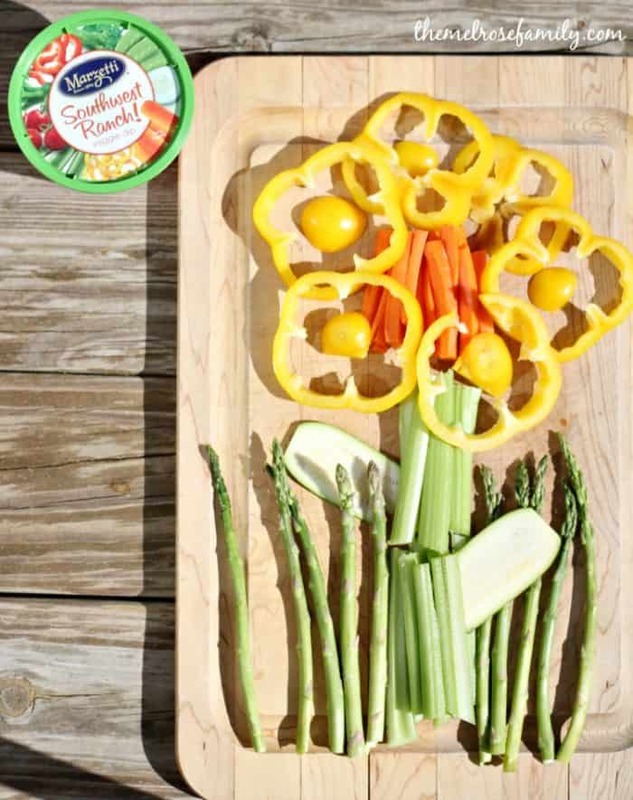 Cut the yellow pepper width wise into rings to create the petals of the sunflower and place them around the carrot sticks. Thinly slice a zucchini into two thin strips to create the leaves of the flower. Place asparagus spears around the bottom of the flower to create blades of grass. Serve with Marzetti® Southwest Ranch Dip. I have never had Marzetti Dressing. My favorite is Aged Parmesan Ranch. Dijon Champagne is my favorite.